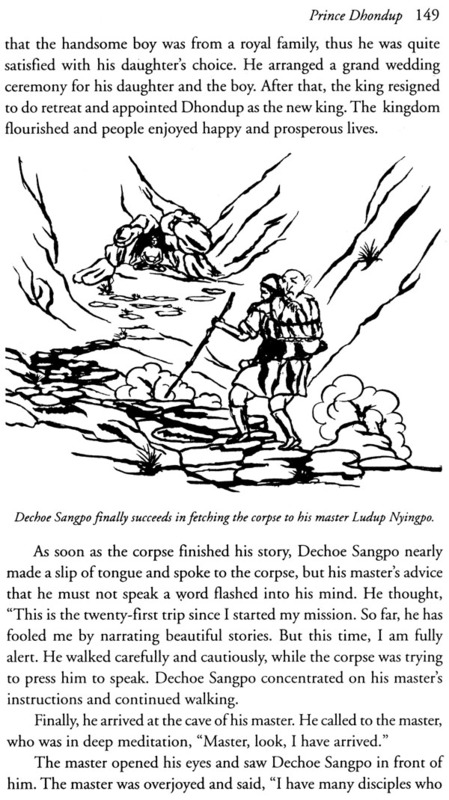 Commonly known as ro-drung (corpse stories), The Tales of The Corpse have been an integral part of Tibetan folk tales for many centuries. 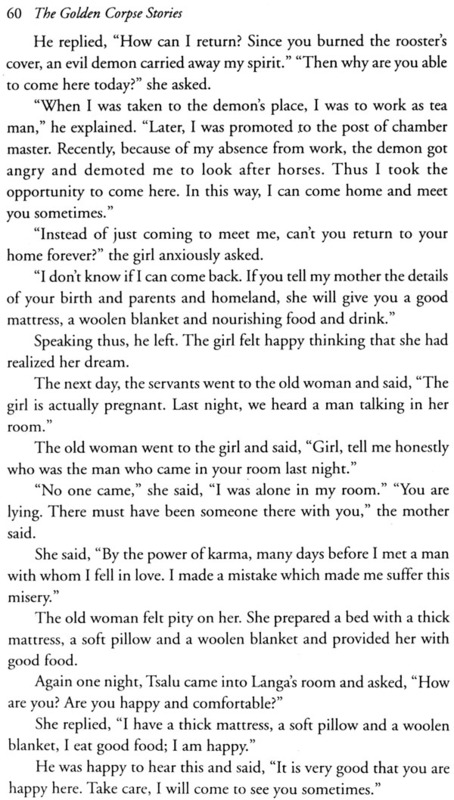 Originally written in Sanskrit by the great Indian Buddhist master Nagarjuna, The Golden Corpse Stories was translated into Tibetan many centuries back. Today, one can find many versions of the golden corpse stories with different titles and number of stories. But despite the differences, the plot and the three main characters (the saint, the boy and the corpse) remain the same. 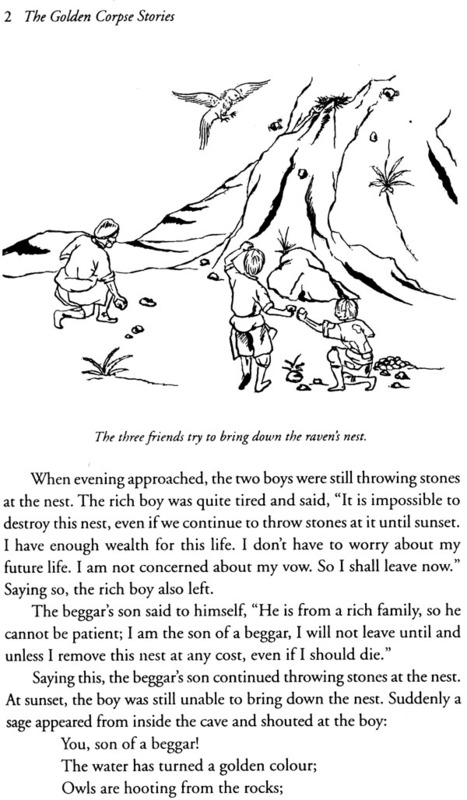 In this collection, a boy accidentally meets a saint and finding the boy determined and honest, the saint assigns him the task of fetching the corpse called Ro Ngodrup Gyatso from the mountain cemetery. The boy must redeem himself by carrying a talking corpse full of wondrous tales on a long journey, without himself speaking a word. These tales of intrigue and magic provide the reader with a window through which to view ancient Tibetan culture. Within them, you will encounter heroes and villains, Fear some witches, murderous demons, and clever tricksters with a uniquely Tibetan humour. Songs, riddles, jokes, and saying make the stories come alive as they unfold against the background of everyday Tibet – its farmers and nomads, kings and magical beings. One of the most important aspects of Tibetan culture is folktales. The unique characteristics, cultural values and beliefs of the Tibetan people are spontaneously manifested in their folktales. Tibet had a strong oral tradition throughout the centuries. So the folktales were a very important medium for the transmission of culture and lessons of practical life from the elder to the younger generation. The folktales also acted as a bridge between the elder and the new generations, as the elder passed down the folktales to the younger. So the social continuum was maintained intact within its cultural heritage. Especially in the modern are, the folktales played a very important role in the development of children’s moral sense and in imparting the cultural values of their society which are not emphasized much in modern education. However, the oral tradition has almost ceased due to the responsibility of Tibetan elders in general and cultural and educational centres in particular to bring all that exist in the oral tradition into print and make them available to readers. The Library of Tibetan Works and Archives, as part of its main objective, endeavors to preserve these folktales. We are very happy to bring the translation of the Ro langs gser ‘gyur gyi sgrung “Golden Corpse Stories” from Tibetan, which were originally composed in Sanskrit by the great Indian Buddhist master Nagarjuna. Although the corpse stories originated in India, Tibetans, both young and old, enjoy them immensely. They Golden Corpse Stories are known under different names, such as the Tales of Ro Ngodup, Tales Ro Ngodup Chen: Wisb-granting Rains, Amazing Stories of a Corpse, Twenty-one Stories of the Golden Corpse, Twenty-five Tales of the Golden Corpse, Tales of the Golden Corpse for the Celebration of Joyful Mind, Golden Corpse Caught in a Net and so on. However, regardless of the difference in name and the number of stories in each collection of the tales of the golden corpse, the plot and subject matter of all these stories are basically the same, derived from Master Nagarjuna, the originator of the corps stories. The corpse stories have also been translated into many other languages, such as Russian, Japanese, Hindi, Mongolian and Chinese. By making this translation available to English readers and particularly to the story-lovers of the world, we hope we are making a small, yet significant, contribution to the preservation of Tibetan culture and the folklore of the world. 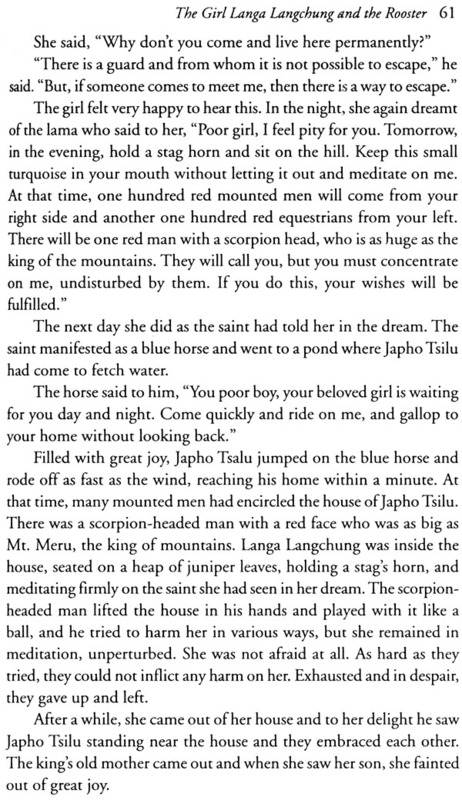 The corpse tales have been an integral part of Tibetan folktales for many centuries since they first arrived in Tibet. Known commonly as rodrung (corpse stories), they are very popular amongst Tibetans, both young and old. Originally written in Sanskrit by the great Indian Buddhist master Nagarjuna, who is called Lopon Ludup by Tibetans with great reverence, the present Twenty-one Corpse Stories of Ro Ngudrup Gyatso, or the Golden Corpse Stories in short, was translated into Tibetan many centuries back. Gradually, based on the Tibetan version of the corpse stories, many Tibetan corpse stories were developed throughout the country. Nowadays, we find many version of the golden corpse stories, varying in the titles and the number of stories. In all the versions, the plot and the three main characters (the saint, the boy and the corpse) are the same. In the present collection, the boy from a beggar’s family accidently meets a saint, who is Master Nagarjuna, a great Indian Buddhist masters. 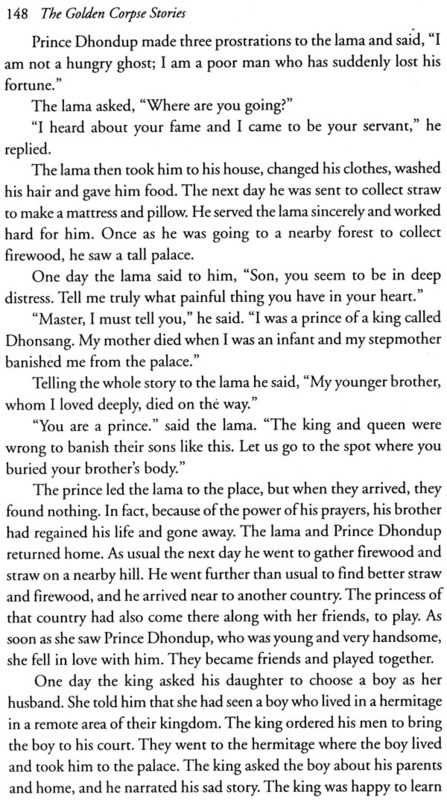 Finding the boy determined and honest, the saint assigns him the task of fetching the corpse called Ro Ngodrup Gyatso from the mountain cemetery. 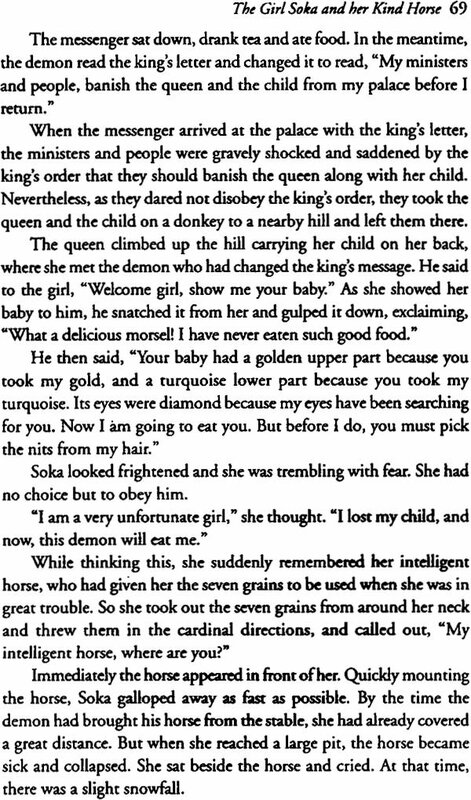 The master warns the boy that the must not speak a word to the corpse while on the way, or else the corpse will fly back to his tree. The corpse is very clever and expert in telling captivating stories. When the boy carries the corpse on his back and starts the journey, the corpse starts telling enchanting stories to the boy, making the boy forget his master’s that he must not speak on the way. 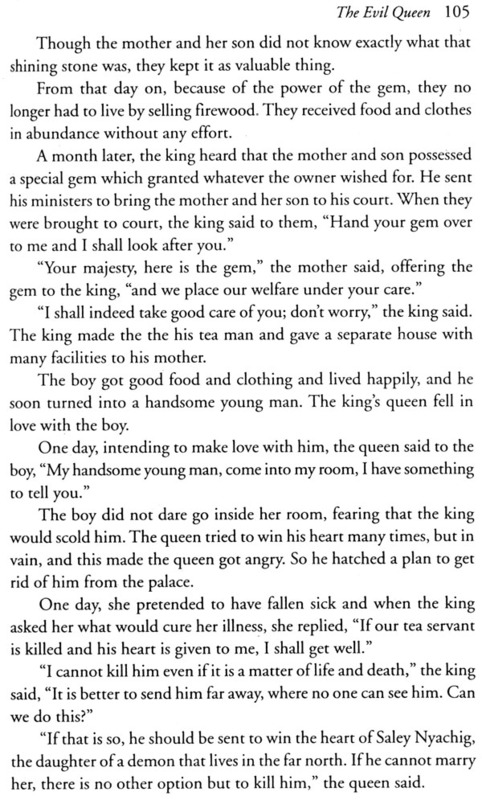 At the end of each story, the boy speaks to the corpse. This repeated 20 times. On the twenty-first trip, he manages to jeep silent and succeeds in delivering the corpse to the saint. The corpse transforms himself into gold, which benefits sentient beings. 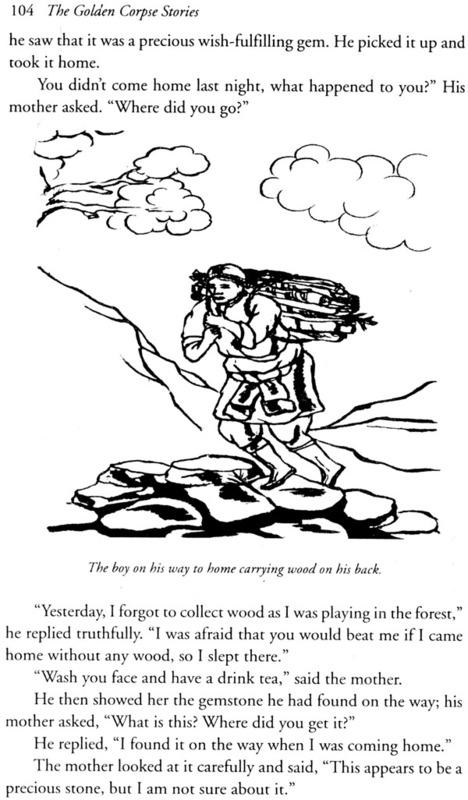 In India, there are many stories called Vikram and Betal tales, which are similar to the Tibetan corpse stories. According to the Indian tales of Vikram and Betal, legend has it that King Vikramaditya (Vikram), the emperor of Ujjain promises a monk to bring Betal, the vampire as a favor promised to him. The condition is that the king should bring the vampire in complete silence, otherwise, the vampire will fly back with the corpse to its abode. As soon as Vikram attempts to fetch the corpse in which the vampire Betal is residing, the vampire starts to narrate a story. 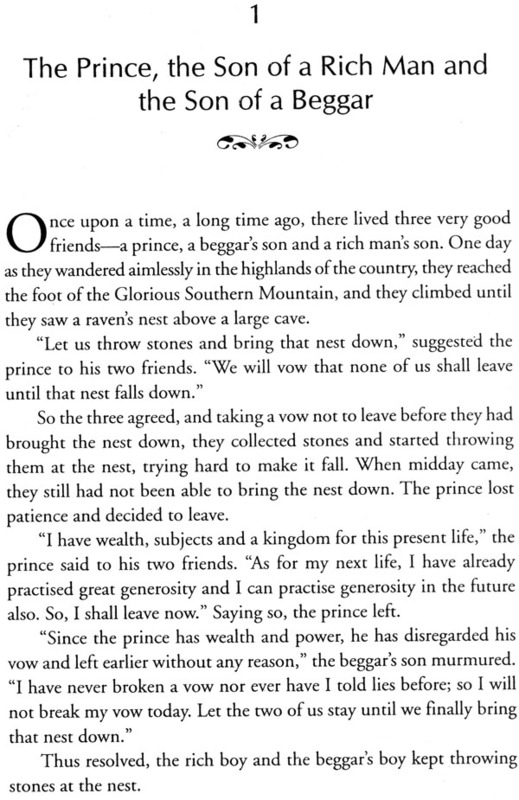 And at the end of every story it completes King Vikram to solve the puzzle of the story, thus breaking his silence, the stories thus narrated by Betal, the Vampire, forms an interesting series of folktales. However, the Tibetan corpse stories differ from the Indian Vikram and Betal tales in significant ways. The Tibetan corpse stories take place in a Tibetan Buddhist cultural setting. The stories contain many Buddhist concepts such as Buddha, karma, rebirth, compassion, deities, demons and other moral lesson, as such they can be regarded as lessons outside classroom for readers in general and children in particular. Regarding the translation convention, I do not claim this as a scholarly translation. I have not attempted to do a literal translation, but I have made some small but necessary additions and omissions during the translation in order to give literary quality and narrative beauty to the stories. So scholars will find many literal discrepancies between the original source and the translation. In conclusion, I take this opportunity to thank from the core of my heart the following people, without whose help this book would not have seen the light of day: Sue Bell (New Zealand), Dr. Alfred Gaba, Katrina Moxey (Australia), and Geshe Lhakdor (the director of the Library of Tibetan Works and Archives, Dharamsala). May the merits I accrued from this works benefit all sentient beings!